DEAR PAPERLICIOUS: Remember Mulberry Paper? Remember Mules? Found an unopened package of Stampin Up mulberry paper. Why I saved this when I did my huge purge a few years ago puzzles me, but I'm glad I did as I love the transparent paper with fibers. The mulberry paper reminded me of feathers, which reminded me of these "mules"
that women used to wear, which reminded me of the cute shoes Julie designed as part of her Twelve Days Christmas set (oh, it is not just a Christmas set) . 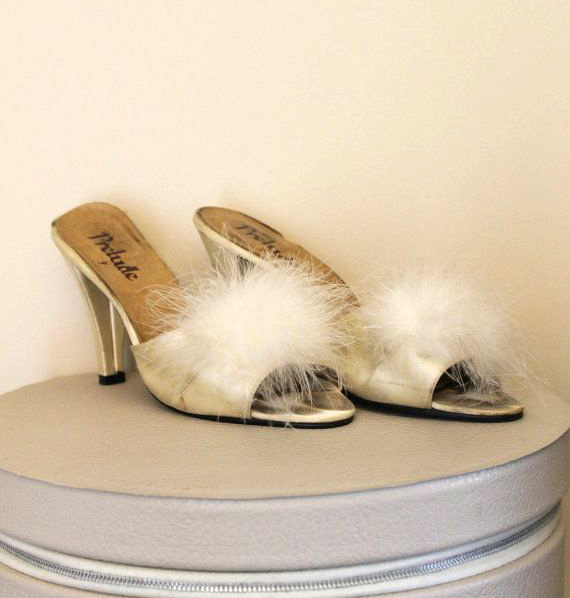 Maybe all of you are wearing these mules with your negligee as you whip up a bacon and egg breakfast for the family every morning, but I'm wearing my LL Bean "Wicked Good Slippers"
with my snuggly bathrobe, and eating non fat Fage yogurt and a banana with honey. So, back to Mother's Day. (Sorry I don't have a photo of the entire card and I already mailed the card to my awesome MIL. As you can see, it wasn't a good photo day). Stamped the shoes on white linen paper and colored with Copics. The cute sentiment on the front of the card (and the inside, which says "Happy Mother's Day") are from the 12 Days Companion Greetings sentiment set. That peek of golden paper under the stamped layer is from Pink Paislee's Bella Rouge 12 x 12 collection. Joan, I love the explanation of your train of thought! I, too, have some mulberry paper still in my stash. What fun! Yes, I had a few pair of those mules back in the 70's (geez am I old enough to be Carole's mother). Anyway, I love your card. I just got that adorable set & I love what you did with it. Enjoy your day. 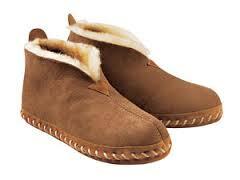 I never had the feather mules, but I definitely had the LL Bean slippers. Wore plenty of heels in the past, though. Cute card! I like the soft, feathery look of the white mulberry paper. How fun! I'm sure you're MIL will love this card. I'm more of a comfy slipper girl too! Can't live without them. 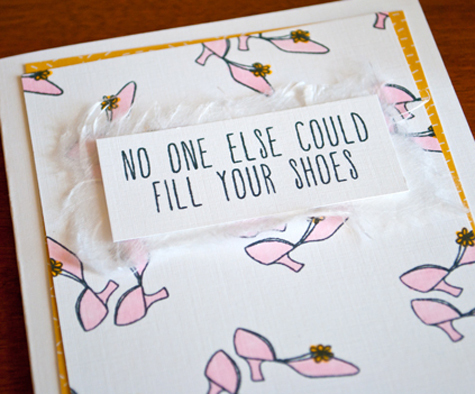 Well I know why, Joan - so you could use it on this darling card! I'm a barefoot girl, all year long... but man I'd like to borrow those mules, and Julie's shoes! YES! had the shoes and have the paper. Love your card. Nice way to let someone know they are special.